Yes, the rich will pay higher taxes under Obamacare. But they aren’t the only ones. 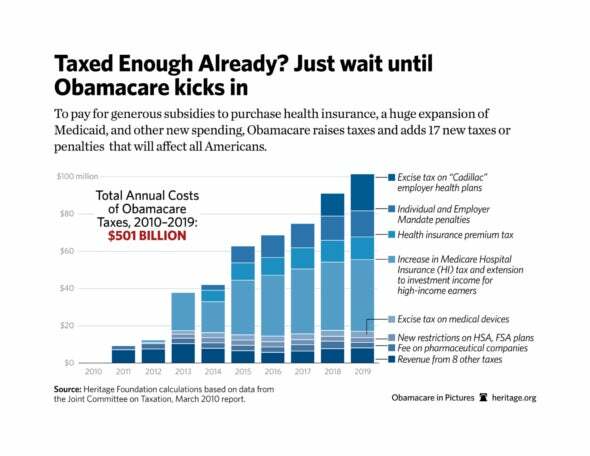 Obamacare raises taxes by more than $500 billion in a decade, and a number of these will hit Americans at all levels of the income scale. The specific tax hikes Coombes describes are initially intended to impact just the wealthy, but it won’t remain that way for long. Beginning in 2013, the law increases the Hospital Insurance (HI) payroll tax from 2.9 percent to 3.8 percent for individuals earning above $200,000 and couples earning more than $250,000. The payroll tax is also applied to these earners’ investment income for the first time. But since the increased tax rates aimed at these higher income brackets are not indexed to inflation, they will impact more middle-class Americans every year. Other tax hikes do directly impact low earners. For example, there’s the tax on “Cadillac” health insurance plans, which low-income and middle-income earners (for example, many union members) also carry; the individual mandate to purchase insurance; and increased restrictions on how taxpayers can use the money they contribute to tax-free health and flex savings accounts. Coombes points out, too, that overturning Obamacare would eliminate the tax credit intended to help small businesses offer insurance to their employees. But the tax credit is already one of the many failures of the health law. Of the 4.4 million businesses it was predicted would qualify, a measly 228,000 (7 percent) have actually applied for the credit. Moreover, the credit is only temporarily available to small businesses for a maximum of six years. Finally, Coombes claims the rich will “save” $21,000 per year if Obamacare is repealed. Let’s be real for a second: Repealing Obamacare wouldn’t be savings to these taxpayers as much as it would spare them a steep tax increase. There is a major difference. If they are saving, then the government had some kind of claim to that money in the first place, when in fact the money belongs to the families and businesses that earned it. It is only “saving” in the sense that the taxpayers were saved from the government’s taking more of what is rightly theirs. Insinuating that wealthy Americans benefit from the repeal of Obamacare is a huge understatement. All Americans would benefit from the removal of this onerous law.